Just as the name suggests, Maui Sunset provides some of the most stunning sunset views on the island. Conveniently situated on 5 acres of perfectly manicured oceanfront lawns, this complex is great for families. A putting green, a croquet field, and two regulation-sized tennis courts make Maui Sunset unforgettable. 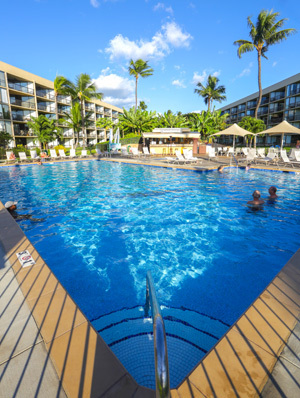 Come take advantage of the resort amenities this oceanfront complex offers. With the largest resort pool on island, a hot tub, a gym, shuffle board, and a sauna, you will never run out ways to relax and recharge! Its location on South Kihei Road in North Kihei is central to all of the activities and excursions Maui has to offer. The charming town of Kihei provides a local Maui experience, with world-class shopping and restaurants in Wailea only a short drive away.